Please note: Picture shows single assembled speaker in Taylor cabinet. Kit includes pair of woofers, tweeters, and crossovers. Cabinets depicted are available via Lee Taylor. Since 1975, Morel has been on an ever-evolving quest to create the perfect, ultimate loudspeaker. This dedication is apparent in every product they produce: tweeters, midranges, woofers, and finished systems that serve the Hi-Fi, home theater, and car audio markets. Morel systems are today sold in more than 55 countries around the globe. Their products are made with exceptional care; each is assembled by hand and extensively tested, undergoing seven different quality assurance steps, to ensure only the highest standards are met. The Ziv II is a 6" 2-way Kit for Hi-Fi Stereo or Home Theater. Cabinets are not included. Price listed is for a stereo pair of drivers and assembled premium crossovers. The Morel Supreme Series SCW636 woofer features a 16 mm long, 3" diameter Hexatech voice coil that provides plenty of deep bass punch, and a copper-covered pole piece design reduces inductance. Morel's Uniflow open frame virtually eliminates diaphragm back pressure and excursion noise. Innovative engineering and an advanced approach to acoustic construction are the reason for Supreme Series tweeters' superior high performance. Their underhung voice coils move in a significantly higher magnetic field and remain there at all times during operation. As a result, the Morel Supreme tweeters provide more linear excursion, eliminate intermodulation distortion, reduce power compression at high levels, and considerably improve low frequency reproduction. Ziv II Kit Includes 2x SCW-636 Carbon Fiber Woofers, 2x ST104-8 Supreme Tweeters- silver-gray faceplate (also available in black), and 2x Assembled Crossovers built with premium audiophile components on printed circuit boards. The Ziv II is a high performance kit using the Supreme SCW-636 woofer and the Supreme ST-1048 tweeter. A kit for the connoisseur, designed to showcase the wonderful detail of the Supreme drive units without sounding harsh or bright. The Ziv II has a very lifelike reproduction of vocals; the sound is clean and detailed with a large and deep soundstage. Bass is tight, controlled at all times displaying subtlety rather than a heavy ponderous sound that many speakers have. This kit includes two woofers, two tweeters, and two professionally assembled crossovers with your choice of series capacitor. You may wish to purchase the optional accessories package which includes all the various speaker building materials required for this project. The Morel Supreme Series SCW636 woofer features a 16 mm long, 3" diameter Hexatech voice coil that provides plenty of deep bass punch, and a copper-covered pole piece design reduces inductance. Carbon fiber/Rohacell/carbon fiber composite sandwich cone. 3" Hexatech™ aluminum voice coil. Copper pole piece sleeve to reduce inductance. Hybrid™ neodymium/ferrite magnet. Uniflow™ aluminum diecast chassis. High power handling. Innovative engineering and an advanced approach to acoustic construction are the reason for Supreme Series tweeters' superior high performance. Sold in factory matched pairs. 110 mm IDR™Improved Dispersion Recess aluminum faceplate. Flat neodymium motor structure provides maximum flux. Hexatech™voice coil for maximum BL product and power handling. Acuflex™coated dome with the perfect blend of internal damping and rigidity. Precisely matched acoustic loading between the dome cavity and rear chamber. 12 liters vented: 15" height x 9" wide x 8" deep. Fb=38, F3= 75 Hz. We recommend a single straight vent 1.5" x 6.5" for this tuning. Woofer below tweeter configuration and rear ported, behind the tweeter. The crossover is 18db/octave on the bass and 12db/octave on the tweeter, with a deliberately mis-aligned Zobel network to adjust the tweeter response. Both drive units to be wired in phase. Madisound professionally assembled crossovers use Goertz Copper Foil 14 awg inductors for the woofer, ClarityCap PX for the parallel capacitors, a Mundorf MOX resistor, and your choice for the critical series tweeter cap. Clarity CSA is the default hi-pass capacitor for C2 (Mundorf shown in picture). Russell Kauffman, Technical Director and Head of Acoustic Design at Morel, has more than 30 years experience in the Hi Fi industry. He studied electronics before starting his career selling Hi-Fi for some of the most prestigious stores in the UK. Over the years Russell has performed a number of roles for companies such as Wharfedale, Monitor Audio, and Bowers and Wilkins as well as operating as an independent acoustic designer. His ”first love” however has always been the sound of Morel drivers which he believes to be special with qualities that cannot be described or quantified by spec sheets alone. 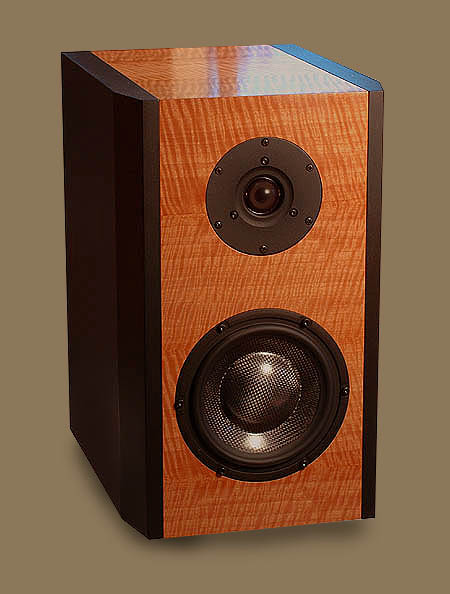 In 2008 Russell was approached by Morel to perform the acoustic design of the Hi End statement loudspeaker the "Fat Lady”, which has since been the recipient of many design awards globally. It is also featured in “The Absolute Sound “ magazine issue 209. All pricing includes at least 10% discount on all drivers, crossovers and parts. Many of our cabinets can be custom built by Lee Taylor & Co. of Philmont NY. Please follow the link below to Lee's website and discuss veneer options and pricing. Lee can also put your speakers together for an additional fee.